Samurai Rock in Lima | personal.amy-wong.com - A Blog by Amy Wong. Unlike Bjork’s concert , which I couldn’t photograph… to even have a faint memory of it. I did get the chance to shoot Miyavi with my good gear, without having to sneak it in… which is good, because this new lens is super huge. Thanks to Noizu who let me in with it. Also, how sucky it is not to shoot for the whole concert while everyone else was recording with their tiny cameras. I’ve been on the tiny cameras side, so I know what kind of photos and video they’re getting. My Maroon 5 cams are quite atrocious. Luckily, those two songs I was allowed to shoot were enough for me to get a few cool photos, but certainly not as many as I would’ve normally gotten for shooting a whole show. Plus, everyone knows the coolest things happen during the middle of the show and, of course, the ending! I mean, I missed photographing Miyavi’s shirtless torso with all his tattoos exposed, I missed shooting him wearing the Peruvian soccer tee, and him waving the Peruvian and Japanese flags. I also didn’t get to shoot much of Bobo, Miyavi’s drummer. Mainly because the first two song had very little lighting, and it was impossible for me to seem him. I got three shots of him, and only used one because I had to show him or I would have felt bad. You can check the whole set, plus my review of the show in YAM Magazine. I also ran into two friends from high school — actually, can you call it “ran into” when I knew they’d be there? LOL I hadn’t seen them in a long while, mainly because I’m a hermit. 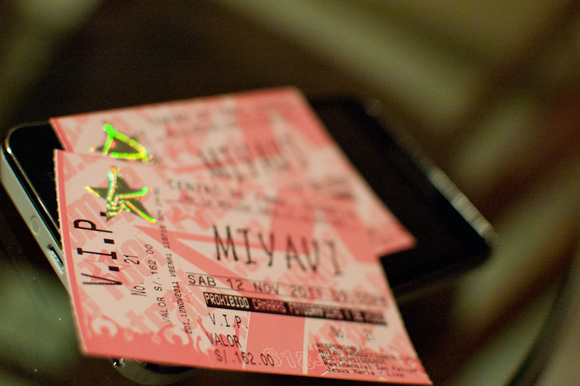 I am not overly invested in Miyavi’s music. Of course, I think he’s amazing, but I don’t think I’m as emotionally involved as I was with Bjork, who literally was bringing tears in my eyes. But then again, a rock concert isn’t really the place to be emotional, right? My concert quota is done for the next two years hahaha. Unless someone brings either BiBi, Leehom Wang, Shiina Ringo, Salyu, or Marit Larsen. Or you know… SM Town happens or some Kpop act comes over like — cough, 2NE1, cough — or Brown Eyed Girls. Overall, good concert. Performance-wise — excellent. Miyavi is truly amazing.